A staple food for for more than half the world's population, rice comes in many varieties — from white to black to short- medium- and long-grained, wild, glutinous, instant, red and jasmine, to name a few. Because it's ubiquitous in Asian dishes and as a side for meat, fish and vegetables, you may not even realize how often you eat it. But is it good for your waistline? The short answer is that some kinds are, and some kinds aren't. Different types of rice have varying calorie counts. On the lower end of the spectrum is wild rice, with 166 calories per cup. On the higher end is short-grain white rice, with 242 calories per cup. Brown rice and long-grain white rice have 218 and 205 calories per cup, respectively. Calories are a primary factor in whether a food makes you gain weight. And it's not a single food, but the total food you eat in a day. If you consume more calories in a day than you burn, you will gain weight. A moderately active adult female needs around 2,000 calories per day. The recommended serving size of grains is 1/2 cup, cooked. That portion of wild rice would provide only about 4 percent of your calories for the day on a 2,000-calorie diet, and 1/2 cup of short-grained white rice would provide 6 percent of your daily calories. While these calories aren't excessive on their own, people often don't stick to recommended serving sizes and end up eating considerably more rice calories. Any excess calories you eat over what your body needs will turn to fat and cause weight gain. Cup for cup, rice is about 80 to 90 percent carbohydrate, the body's main source of energy. Wild rice provides 17.5 grams of carbs per 1/2 cup, while short-grain white rice provides almost 27 grams. The recommended daily intake for carbs is 45 to 65 percent of total calories. If you consume an average of 2,000 calories daily, that's about 900 to 1,300 calories from carbs, or 225 to 325 grams of carbs per day. 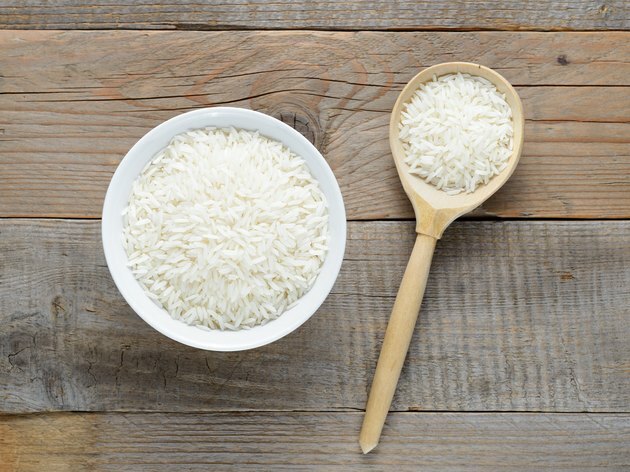 One-half cup of white rice provides 70 calories, or between 5 and 8 percent of your daily carbohydrate needs; 1/2 cup of short-grained white rice provides 108 carbohydrate calories, or between 8 and 12 percent of the daily carb recommendation. One-half cup of rice — assuming you stick to that portion size — fits in with the daily recommendation. However, not all carbs are processed the same by the body, and some carbohydrates may have more of an effect on whether or not rice makes you fat. It has to do with the type of rice, and also how the rice is processed. Whole-grain rice, such as long-grained brown rice and wild rice, is unprocessed. It contains the bran, germ and endosperm. White rice of any type has been refined, meaning its bran and germ — as well as many of its vitamins and minerals — have been removed. However, the bran and germ provide much of the dietary fiber, a type of carbohydrate that affects digestion and is key to good health. The glycemic index, or GI, is used to measure how a particular food affects blood sugar after it is consumed. Foods with less fiber are typically digested more quickly. The body breaks down the carbs into their smallest particles — sugars — which are immediately absorbed into the bloodstream. Fiber slows down this process, so that the sugars enter your bloodstream more slowly; rather than a quick rush, you get a steadier stream of energy over a few hours. The higher the GI rating, the more quickly and dramatically a food raises your blood sugar. For reference, white sugar has a GI of 100. With almost 2 grams of fiber per 1/2 cup, whole-grain brown rice has a GI of around 48. Short-grain white rice contains no fiber and has a GI rating of 76. Any food with a GI over 70 is considered a high-GI food. The problem with carbs that are digested and absorbed very quickly is that they can cause blood sugar lows that lead to fatigue, mood changes and food cravings, according to a 2015 analysis in The American Journal of Clinical Nutrition. After you eat a simple carb — like white rice — you may quickly feel hungry again, and your body may hunger for more simple carbs. This doesn't help you control your appetite and maintain your weight. Whole grains — such as unrefined brown and wild rice — help you feel fuller for longer. Their higher satiety value helps you curb your calorie intake so you can maintain your calorie balance and prevent rice weight gain. To maintain your weight — and steady blood sugar levels — avoid refined white rice whenever possible. Instead, choose hearty brown, wild or black rice varieties, and stick to a 1/2 cup serving. If you do eat white rice, have it with vegetables or another source of fiber, as well as protein, both of which can help mitigate the effects of the white rice on your blood sugar and help you feel full for longer. Read more: 19 High-Fiber Foods — Some May Surprise You! Calorie Control Council: Why 2000 Calories? USDA Choosemyplate.gov: What foods are in the Grains Group? Medical News Today: Tips for better digestion - how long does it take? Is Rice Good If You Are on a Low-fat Diet?